When it comes to finding the right family dentistry in the Malta area, it’s easy to feel overwhelmed with choices. We’ve put together a quick guide on choosing the right dentist for you. Read on to help reduce that sense of stress, and we’re sure that you’ll quickly find Salvatore Dental to be the ideal dentistry for you and your family. It’s more than just the three most important parts of the real estate industry, it factors into your choice of dental care clinics. When you choose a family dentistry, you’ll find it’s easier to schedule appointments, and you’ll arrive right on time, every time. The easier it is to get to your dentist, the more likely you are to go. You’ll save time, gas, and your smile! Our dental clinic is conveniently located in the Malta Commons Complex, next to the YMCA Daycare, and just two miles from Global Foundries. We understand that for some people, the dentist isn’t high on their list of favorite places. A good dentist should make your visit as comfortable as possible. They should listen to your concerns and thoughts, and make helpful decisions that work best for you. 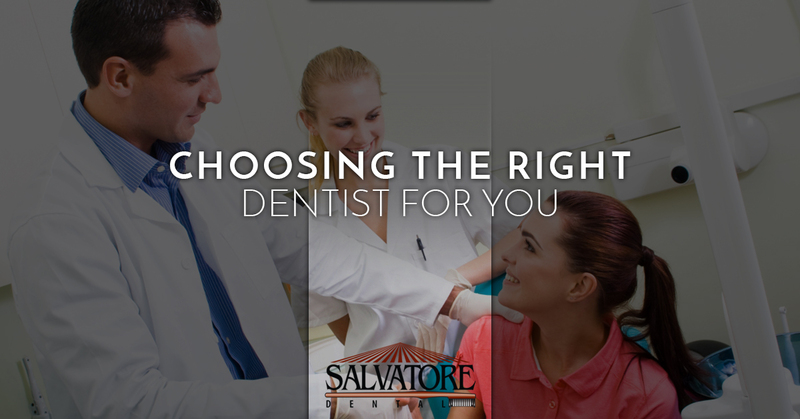 Salvatore Dental makes it our mission to provide the most comfortable dental care experience possible. While you might be nervous when you first sit in our chairs, we hope to change your mind with our attentive care. Our clean and modern office is designed to prioritize your comfort at every stage of your visit. Any dentist you work with should be of the highest professional quality. After all, this is your oral health we’re talking about. Dental staff should be able to competently answer your questions and satisfy any curiosities you might have about their practice. Your dentist should always remain on the cutting edge of dental health practices. The best family dentists continue to receive ongoing education and training. With three generations of dental care specialists in-house, Salvatore Dental is always looking for new ways to best care for you and your family. Dentistry has come a long way from the barber-dentists of old. Dental technology has dramatically improved over the last few decades. A good dentist should stay current on these technological trends. We utilize the latest in dental technology; our cavity detecting lasers and x-rays can help accurately and precisely determine if you need a cavity filled, or if you need other smaller fillings. In each room, we provide a small screen to walk you through your visit and educate you on what your dentist is doing that day. All of these advancements make sure that you always know what steps our staff are taking and why. Every smile is unique, and your dental care should be tailored to your needs. A good dentist should be familiar with any pre-existing oral health issues you might have, as well as being well-versed in a wide selection of preventative measures to keep your smile bright and healthy. To meet any dental needs you might have, our competent staff is trained to perform almost any dental service you can think of! From extractions and implants to same day crowns, we’re here to keep your mouth happy and comfortable. It’s easy to peruse a few websites for family dentistry, and then pick out the one with the best-looking website. While you might be impressed with their web-presence, you might be less impressed by their bedside manner as they work in your mouth. It’s best to schedule a consultation with a new dentist to make sure they are a good fit for you and your family’s dental health needs. If you don’t get along with your dentist, you likely won’t be happy with the quality of care you receive. Lucky for you, we’re excited to bring new patients into our practice. Salvatore dental is proud to offer special deals for new patients. We’re just a quick call away! Ultimately, the right family dentistry for you will take into account a variety of factors. A great dentist is nearby, listens to your needs, makes the effort to prioritize your comfort, stays current on best practices, is aware of your specific needs, and is friendly and easy to work with. If you’re thinking that Salvatore Dental meets all of these qualifications, you’re absolutely right! The Doctors Salvatore and their staff are here to provide you with the best quality oral health care, while also educating you and your family so you can best maintain your smile.